This fluorine based plastic is a melt-processable copolymer (ethylene tetrafluoroethylene) offering impressive corrosion resistance, heat resistance, easy processing and superior physical toughness and strength over a wide temperature range. The mechanical and electrical insulation properties of ETFE are outstanding. It maintains stable mechanical and electrical properties while exposed to temperatures ranging from -200°C to +150°C. Superior tensile elongation and strength ensure no breakage by impact at room temperature. It is even resistant to low-temperature impact down to at least -80° C. Tolerant to almost all chemical agents and solvents, Fluon® ETFE resins are also resistant to ultra-violet light, ideal for outdoor applications. Supplied as standard in pellet form, Fluon® ETFE resins can be processed by extrusion, injection moulding and blow moulding. Applications include wire and cable coating for automotive applications, robotics and electronic equipment, tubes, films, sheets, tape and parts for the semi-conductor industry. This white fluoropolymer can be pigmented and is Fluon® ETFE blended with a unique fluoroelastomer. It is more flexible than other fluoropolymers with excellent heat and chemical resistance. Fluon®AR-3300N is ideal for wire and cable coating. Fluon® LM-ETFE has even better thermal stability, heat resistance, stress crack resistance and is more flexible and transparent than standard ETFE. The LOI (limiting oxygen index) is also improved. It can be processed at a wider range of temperatures due to its improved thermal stability and lower melting point. Fluon® LM-ETFE adhesive resins have been engineered to provide enhanced adhesion when bonding with polyamides (PA). The ‘AH’ range is ideal for co-extrusion applications, such as fuel hoses, where ETFE barrier properties are crucial. An anti-static version is also available. 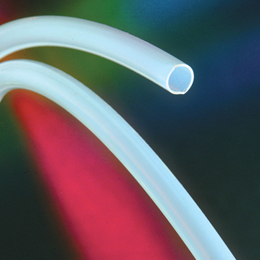 Fluon® LM-ETFE Adhesive Resins are used in the SUNBESTA® fuel hose system. 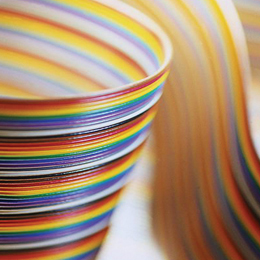 The special grade, Fluon® LH8000, is an ultra-low melting ETFE resin with built-in adhesion ideal for co-extrusion with many polymers, including HDPE (with a tie layer) and directly with PA – ideal for giving fluoropolymer properties (only a thin layer is required) to the inner layer of other polymers. These products give a higher service temperature and greater thermal stability compared with conventional ETFE. Designed for wire and cable extrusion, ‘HR’ ETFE has an operating temperature window of -180°C – +180°C whereas ‘HT’ ETFE can perform at 175°C and 200°C meeting automotive standard LV112, Class E and Class F.
Fluon® ETFE Compound Grades give improved properties compared to standard ETFE resin. A variety of custom reinforcements and conductivity levels are available. 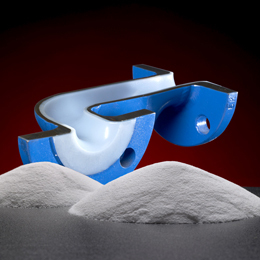 These various filled grades grant enhanced properties, such as reduced mould shrinkage, improved wear resistance and increased flexural strength. Fluon® ETFE is available in powder form for non-stick and corrosion-resistant applications. It is applied by electrostatic coating, fluid bed dip coating and rotolining.